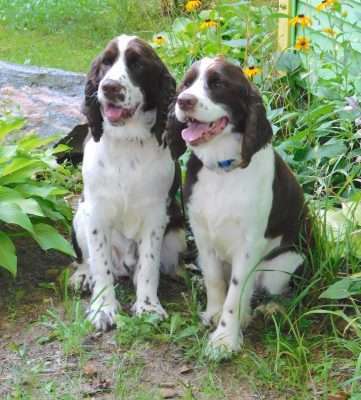 Adopting a bonded pair is not the answer for every home, but it's the perfect answer for many. In some cases, a bonded pair is a parent with an offspring. Sometimes it is two littermates — puppies, teenagers, or even seniors. Occasionally the two dogs are simply long- or even short-term companions with no blood relation at all but with a well-established bond through their shared life experiences. 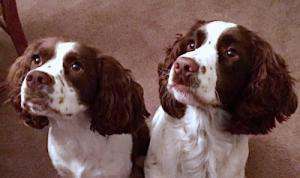 These are dogs who, even though they may be otherwise well socialized, have come to depend upon each other as a survival technique. They seem to rely on one another for their social cues, for confidence building in new situations, and for stress relief from any uncomfortable predicament they may experience. 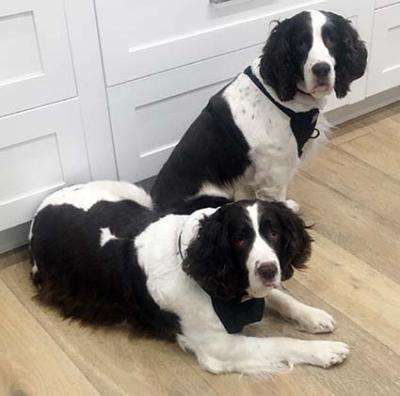 We’re not talking simply about any two dogs who have come into the ESRA program together, despite the fact that they may be connected by blood or previous family situation. Two such dogs may very well be placed in separate homes so that they may both become “the best dogs they can be.” One dog may thrive away from the shadow of the other, more dominant dog. In contrast, a truly bonded pair honestly has a visible cadence that seems to control their every move and their every response to their environment. They deserve to be kept together. Why adopt a bonded pair? First, there is the undeniable realization that you have brought not just one, but two dogs, baffled and confused by an unexpected turn in the world they previously knew, into a safe, secure, and loving home. What a feeling! Second, the adjustment into their new environment is eased simply by the fact that these dogs still have each other. Security trumps fear in so many cases! Third, having a built-in companion and playmate provides stimulation that reduces boredom, destructive behavior, and potential separation anxiety. Ivie Mae and Reuben had to be rehomed by their former family due to health reasons. 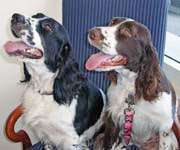 They are delightful, loving, and funny Springers who would be a joyful addition to any household. These two homebodies enjoy cuddling, sleeping, chewing on their toys, and walking around town or through the fields on their leash. They are Velcro dogs who always want to be near each other AND their people. Destiny and Joy are best friends. We’re not sure if they are sisters or mother and daughter. Whatever their relationship really is, they are very bonded and don't like to let each other out of sight. These two girls have had a couple of homes prior to coming into ESRA's care. They were initially stressed by the shelter environment. Since then, they have made great progress working on remedial obedience with their foster mom. All the commands are coming along, but work still needs to be done to walk on a leash without pulling. Both dogs are very sweet and truly want a Forever Home together. Would you like a double dose of loving? If so, contact their coordinator to find out more about this special pair. 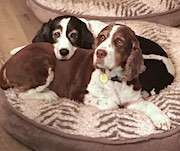 Introducing a special duo, 6-year-old blind Springer Phoebe and 5-year-old Rito, a Beagle who serves as her “seeing-eye dog.” Since they grew up together and Rito helps Phoebe get around, we are offering them as a bonded pair. Both dogs are playful, sweet, and friendly and were family pets until their family fell upon hard times. They are housetrained, spayed and neutered, and up to date on their shots. They are getting along well with the other dogs in their foster home and adapted quickly to new surroundings. Winston and Lily are siblings who have been together all their lives and would love to stay together. They have been well cared for and are very much loved. However, due to a lifestyle change recently, they need to find a new Forever Home. Winston and Lily are house trained, good with children and unknown with cats. They are spayed/neutered, microchipped, current on vaccinations and heartworm negative. If you're looking for a pair, please send us your application right away! Out-of-state adopters must be willing to drive to Texas to adopt this great pair. Want to adopt double? Apply to adopt now! Sammy and Sasha are rarely apart — they eat together, sleep together, and walk side by side on leash. Even when they are sleeping or just lounging around, they have to be touching one another somehow, whether it be a full body spoon or just a head pressed against the other's bottom. However, this does not mean that they don’t love their humans! Once you sit down, you are sure to have these girls in your lap or snuggling next to you. ESRA found the perfect Forever Home for these lovely girls, where they happily share their love for each other and their new family. These two little girls, who we think are sisters, are the quintessential bonded pair. Their introductory ESRA bio read like this: They are like a couple skating in the Olympics together. They know each other's every move and are in absolute tandem while playing. When they run in the yard together, they turn, split to an outward circle, and then meet up together at the end of the run — thrilled to be together again! These little beauties didn't wait long for their Forever Home, and they now spend their days frolicking in the Florida sunshine. Little puppies Sam and Abby were found as strays on the North Carolina coast. When they were brought into ESRA's care, it was discovered that they both suffered from juvenile onset cataracts and would eventually lose their sight. At the time, young Sam's eyesight had already deteriorated to the point that he relied on Abby as his “guide dog.” Therefore, the need to find them a home together was even more important. Could ESRA rise to the challenge of placing not just a bonded pair, but a bonded pair with special needs? Yes, we could! Little Sam and Abby are today growing up together in the clean, fresh air of the North Carolina mountains. 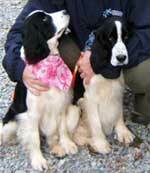 These wonderful Springers had their world turned upside down when their owner needed to move and was unable to take them with her. Louie and Katie have always been together, and they needed to stay together when they were adopted. 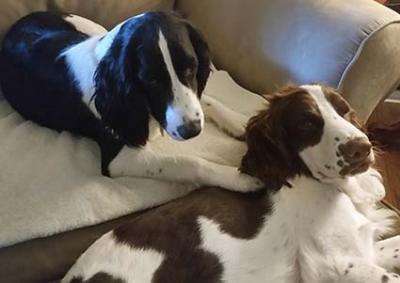 ESRA found them their ideal home where they are loving companions for their Forever Family while going for walks, working in the yard, or just relaxing in the house.